Here we will discuss true facts about lightning. On a small scale, all lightning is created equal. Lightning is defined as the occurrence of a natural electric discharge that typically lasts for a short duration of time. Lightning is known for its high voltage and its emergence from a cloud that is accompanied by a bright flash and the loud sound of thunder. Lightning is a channel of ionized air which carries this electric current between two areas of charge. The polarity of how lightning is discharged affects the way it branches in the air. Lightning is beautiful to watch, but it is also dangerous. There is nothing like sitting on the front porch and watching a lightning storm, beholding the sheer power of nature and watching its natural beauty in action. Here we will discuss the different types of lightning as well as take a look at how dangerous it can be. The thing to understand is that while all types of lightning are essentially the same, there are varying types of lightning, each with its own characteristics. Negative CG-This type of lightning occurs when there is a discharge between a cloud and the ground. It is initiated by a downward moving strike of lightning which is negatively charged. It is referred to as a step ladder lightning strike. Negative cloud to ground lightning strikes are one of the most common types of lightning strikes. These types of lightning strikes are typically identified for their downward branching movement and return strokes. The return strokes of this type of lightning is made up of consistent additional pulses of electric currents that illuminate the main channel of the lightning. 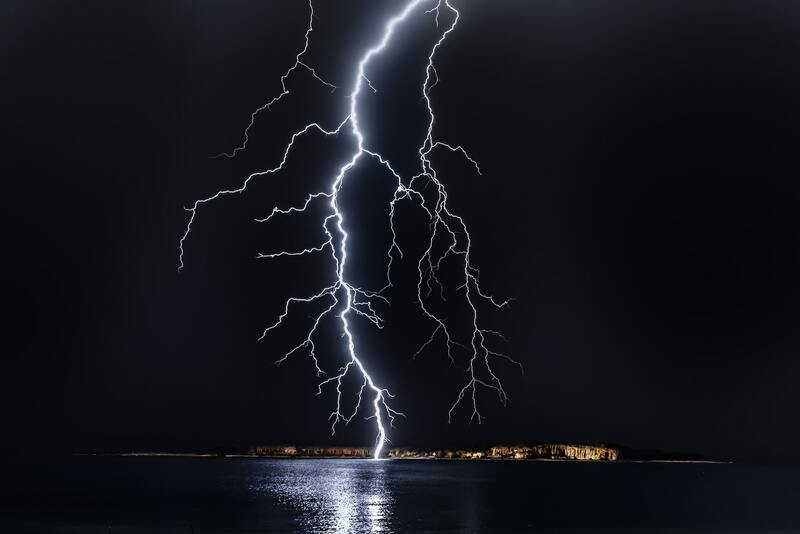 The first return stroke of this type of lightning is the only branched one, which is not illuminated again in additional return strokes. Positive CG-This type of lightning occurs between a cloud and the ground. It is initiated by a downward moving lightning strike which is positively charged. These types of lightning strikes are typically associated with supercell thunderstorms or stratiform precipitation regions. These types of lightning strikes are identified by distinctive lack of branching from the main strike or branching at higher altitudes. A positive cloud to ground lightning consists of only one return stroke which is bright and very loud with sounds consisting of low frequency sonic booms. This type of lightning is another common type of lightning. This lightning forms inside of a single storm cloud, which jumps between different charge regions within the cloud. This type of lightning is commonly referred to as sheet lightning due to the fact that these lightning strikes will light up the sky in a sheet of light. The parts of these lightning strikes are often obscured by the cloud they originate from, hence they may or may not be visible to an observer studying the lightning from the ground. This type of lightning strikes is referred to as anvil lightning. This name comes from the fact that this type of lightning strike discharge occurs away from its parent thunderstorm. This type of lightning strike occurs from the highest regions of a cumulonimbus cloud, which then travels from the cloud before making a descent to the ground. Another classification of this lightning is that it can occur when there are blue skies overhead, not necessarily in a thunderstorm. What is the most dangerous type of lightning? While all types of lightning can be dangerous, there are some lightning strikes that are more dangerous than others. The most dangerous type of lightning is Bolt from the Blue lightning. This type of lightning strike is incredibly dangerous due to the fact that they can strike at any time. Bolt from the Blue lightning doesn’t need to originate from a thunderstorm overhead. They can travel from their parent storm and travel vast distances before striking the ground. What is the difference between sheet lightning and fork lightning? Sheet lightning-also referred to as intra-cloud lightning, is a type of lightning that occurs within a cloud and lights up the sky in a sheet of luminosity during the initial flash. While this type of lightning strike itself can’t be seen by an observer on the ground, the sheet can be seen in the cloud. Fork lightning-fork lightning occurs when there is a sudden flash of lightning with two or more lines of light branching from the initial lightning strike. This happens inside of a cloud or between a cloud and the ground. What Color Lightning is the Strongest? There are different color types of lightning and each color can provide an insight into how dangerous a strike of lightning is. Blue – this color of lightning is an indication that a high precipitation storm is occurring with chances of hail. This color reflects the radiation from the sun and scattering light from atmospheric particles. Purple – this color of lightning occurs when there is high humidity in the atmosphere and is typically accompanied by high precipitation. Yellow – while this color of lightning is uncommon, it can be caused when there is a high concentration of dust in the air. It can also be an indication of a dry thunderstorm with low levels of precipitation. White – this is by far one of the most dangerous color of lightning due to the fact that this type of lightning is the hottest. This color can indicate a low concentration of moisture in the air as well as a high concentration of dust in the air. Green – discussed in-depth in the Green Lightning article. Yes, lightning can absolutely kill you. Being struck by lightning can have a profound effect on the human body, but how lethal it is will depend on how you are struck and the force of which you are struck. Being directly struck by lightning can cause the body to go into cardiac arrest, respiratory arrest, can cause memory loss, seizures and can cause serious burns all over the body. Because of how lethal lightning strikes can be, it is important to practice proper lightning safety. During a lightning storm, be sure to stay indoors in a home with proper electrical wiring, avoid being in the shower and turn off all electronics. Now that you know of the different types of lightning that exist, the most dangerous colors of lightning, how lethal lightning is and what the most dangerous type of lightning is, you will understand how to stay safe when lightning strikes.